So another year, another Critical Care Reviews meeting. Rob is doing an absolutely fantastic job with these, inviting lead authors from major critical care trials to present and defend their work. In fact, this is going so well that this year he appears to have convinced the editor of the NEJM to coincide publication of one of the most eagerly awaited ICU studies of the year (ADRENAL1) with the meeting, allowing a fanfare launch and setting the platform for robust discussion and knowledge translation. I couldn’t make this year, but several of my colleagues attended and hats off to Rob for his efforts. There was a rapidly deleted tiny spoiler the day before but perhaps this was all part of the grand plan to whet your appetite…..
We suggest against using IV hydrocortisone to treat septic shock patients if adequate fluid resuscitation and vasopressor therapy are able to restore hemodynamic stability. If this is not achievable, we suggest IV hydrocortisone at a dose of 200 mg per day (weak recommendation, low quality of evidence)5. Interesting stuff and certainly a worthwhile project. 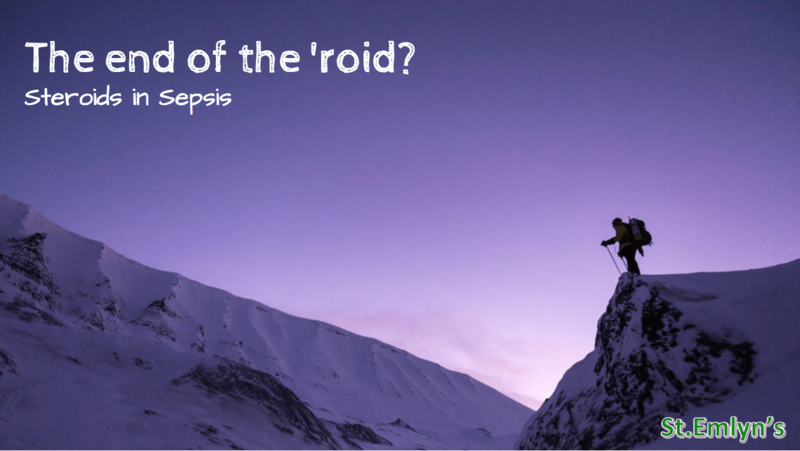 I suppose from a practical point of view, my practice and I think that of my colleagues on ICU is to only introduce steroids in the above doses at present for what I consider to be ‘resistant shock’, in line with the above recommendation. It is worth thinking about this before you read on though. What do you consider to be ‘vasopressor resistant shock’? Is this after you have exceeded a certain dose of noradrenaline? Is it after the introduction of another agent (vasopressin or dobutamine) have not solved the problem? Is it after an echocardiogram and POCUS have demonstrated no other obvious cause aside vasoplegia, but you just can’t get on top of the BP? Or is it only when cardiac output monitoring confirms a persistently low SVRI despite your best efforts…? I suspect we all differ here and I have to confess when I picked up this paper I was hoping it would address this issue. But the paper itself? Currently FOAMed (Hurrah! ), succinctly and expertly written as you would expect from this collaborative and well thought through regarding methodology. The trial protocol is also worth read, and their are more supplementary appendices than you can shake a stick at, but all good stuff and the authors should be praised for maximising the transparency of their work. As always, we would suggest that you spend a few hours with this yourself and draw your own conclusions after thorough critical appraisal, but we have tried to draw out the key points and give our take on it below. You should also have a look at the supplements and at the trial protocols which have a wealth of additional information. I’ve also put some links to other #FOAMed resources at the bottom of this page. Are these patients the same as mine? Well, to get in this trial you had to be 1) SICK (mechanically ventilated, although interestingly this included NIV) 2) have a SUSPECTED INFECTION (documented suspicion by a treating clinician and fulfilling at least 2 SIRS criteria) and 3) were ALREADY BEING SQUEEZED (at least 4 hours of vasoactive medication). This seems pretty robust to me. Exclusions included those patients were a clinician expects to prescribe steroids for another reason, treatment limitations, a delay to recruitment >24h after meeting all inclusion criteria and pre-existing condition from which the patient was deemed likely to die within 90 days from randomisation. I suppose if you wanted to be picky this latter criterion always allows a bit of subjectivity around recruitment. Also there is no mention of lactate here. However, the authors have wisely pre-empted this latter query in table S2c of the supplementary appendix. They report that over 75% of their overall cohort had a lactate >2 at randomisation, with a median of 2.7 (IQR 1.7 to 4.8). However, when they look at what proportion of recruits had a MAP <65mmHg AND a lactate >2 this drops to 52.5%. Makes you think a little about the severity of illness in these patients. If you skip forward to the baseline characteristics the median APACHE across groups was around 24. Scores higher than 25 are supposed to correlate with an increased mortality (50%) so this serves as more information about the severity of illness in the cohort. What is interesting. and especially if you watch the editorial by Kathy Rowan on the Critical Care Review site is that the mortality in the patients differed greatly between the different countries. IN the UK the Mortality was much higher. There are many reasons why this might be. Patients may have to be sicker to get onto the ICU in the UK, pathologies might be different, or maybe the quality of critical care is different. I’m not sure we can tell from this study and the data currently available but that difference in mortality certainly makes me thik that there is something different about the UK patients as compared to the Australian/NZ patients. Having said that there is no real difference in mortality in the UK sub group analysis and so the signal appears to the be the same. Otherwise, recruitment across 69 sites and 12 UK centres suggest to me that the results of this study are generalisable. How did the methodology try to limit bias and confounding? As you would expect this trial is no outlier. This was an international, pragmatic, parallel group, placebo controlled, double blind randomised controlled trial. Randomisation was stratified and delivered centrally through a password protected and encrypted web based algorithm. Allocation concealment was maintained following approach and clinicians then delivered a blinded intervention, implying that all further clinical care would not be influenced by the intervention. There was even assessment of the integrity of trial blinding by an independent person assessing a random sample of medication packs throughout the trial. This methodology is reflected in the baseline characteristics table, where there is very little to spot in terms of difference between the two groups, other than the intervention in question. Most end points were hard, especially the primary. It is difficult to get from the paper exactly who collated the secondary outcomes, and how, but the implication is of a research nurse uploading to a data entry portal rather than those involved in clinical care. There was a trial steering committee, interim analyses etc.. You get it, this was done robustly. Sample size calculations were performed and prospectively published with the trial design and the analysis was prepublished. More on those later. What were the headline results? Well, the primary outcome is really quite clear as portrayed in this Kaplan-Meier curve from the trial. At 90 days, no significant mortality benefit was seen from the use of hydrocortisone to treat septic shock. Out of 3800 patients, you were pretty much likely to be as dead or not at 90 days, whether you received hydrocortisone or placebo. I see. Thats the nail in the coffin is it? What about the secondary outcomes? It get’s very interesting here. Although the authors report no associated mortality benefit, they do describe several differences between groups in favour of hydrocortisone. The intervention group sent less time on mechanical ventilation (HR 1.13; 95% CI, 1.05 to 1.22; P<0.001), less time on critical care (HR 1.14; 95% CI, 1.06 to 1.23; P<0.001), had a faster shock resolution time (HR 1.32; 95% CI, 1.23 to 1.41; P<0.001) and a lower rate of blood transfusion (OR 0.82; 95% CI, 0.72 to 0.94; P = 0.004). Now these margins are all slim; Critical care LOS was median 10 days in the intervention group versus 12 in the control for example, shock resolution 3 vs. 4 days and duration of mechanical ventilation 6 vs. 7 days respectively. Indeed, when you start to collate some of these margins and look at ventilator free survival days no significant difference is seen. However, it has been already rightly pointed out by some that patients may very well value these endpoints, as may clinicians and (dare we say it) managers involved in capacity planning for critical care occupancy. I said before, I wanted this paper to look specifically at those with vasopressor resistant shock. The authors present this data in the main paper as a subgroup analysis, looking at patients receiving <15mcg/min vasoactive agents compared to those receiving >15mcg/min. Assuming most patients were on noradrenaline, this essentially transcribes to dichotomising between those on <11mls/h of 4mg in 50mls (what I would call ‘single strength’) and those on >11mls/h of the same concentration. This ignores the fluctuations in patient weight and the universal mcg/kg/min standardised dosing, but does I suppose represent a degree of vasopressor prescription seen to be above ‘ordinary’ for most patients. Certainly, when I start prescribing double or triple strength noradrenaline for these patient (which I have to usually when the rate of single strength infusion escalates into the teens) it serves as a cognitive stop point for me; am I sure there is no obstructive or cardiogenic shock contributing to this picture? I am sure about the degree of volume loading? 1654 patients fall into the >15mcg/min subgroup and the mortality rate is reduced in the intervention group, albeit without reaching statistical significance (0.86 (0.70–1.05)). I don’t like to use the word trend, but this result did get me thinking. Other interesting subgroup analyses include strong trends towards improved survival with hydrocortisone in those with an APACHE score <25 and those receiving the intervention between 6-12 hours following shock onset. This latter result seems hypothesis generating regarding the administration of steroids to suppress endovascular toxaemia, until you see that in the <6h group outcomes were generally worse. Well, it feels like a quibble but they didn’t actually get as many patients as they wanted. Sample size was set at 3800, allowing for a subsequent 1% drop out and loss to follow up. They met the recruitment target, but then excluded 3% of subjects and lost a further 0.8% to follow up, thus analysing 3658 in total. A quick poke with a power calculator suggests they would still have enough patients to me and maintain a Beta of 80-90%, but I’m no stats guru. In addition you need to concentrate to follow the numbers through the trial. 3800 patients were recruited, baseline characteristics are reported in 3713 patients, whereas the primary outcome is assessed in 3658 as above. This presumably explains the 1.9% of patients in the placebo group recruited to the trial who were not receiving antibiotics for example, as has been queried, but this is not explicit in the paper. Open label steroid use occurred in 5-10% of patients. This is openly reported and not a limitation per se, but does potentially impact interpretation of results. The patients were perhaps not as sick as expected based on the median APACHE scores; perhaps this reflects recruitment as per the preceding definitions of septic shock described by the 2001 task force. You could argue about mortality at 90 days as less relevant to intensivists than other groups, but I agree it’s pretty patient centred. In addition the authors report 28 day mortality in the supplementary appendix, with no demonstrable difference in outcomes. Although the Kaplan-Meier chart looks like it’s diverging, the adjusted odds ratio for mortality reported is 0.89 (0.76 to 1.03, p=0.13) at this earlier stage. Lastly, I think you could nit-pick and argue about the pragmatism and lack of protocolised care – this is a limitation in some ways but not in others. Am I sure that the way they treat septic shock in other countries is the same way I do it? I would assume that adherence to SSC is fairly widespread, but there will be undoubted geographical variation. Without protocolised care (and subsequent Intention to Treat and per protocol analyses) we cannot be sure, and are left a little uncertain regarding the external validity of this work to our patients. However, the pragmatism here is also a great strength. Clinicians all treat sepsis slightly differently in my experience. The authors here have managed to report large scale data on whether the addition of glucocorticoids, to what we all consider to be our best practice, has any impact. I am not sure they would have achieved the set up or numbers they have with a strict protocol, and any such pathway would no doubt have undergone extensive criticism on publication unless it had incorporated new evidence based changes on an annual basis. What has been the take on it so far? Lots of good questions coming out of the CCR meeting. What about the incidence of delirium incidence and sleep quality in patients receiving steroids? There are lots of other negative side effects from steroid use outside the reporting scope of this paper. But even when you look at the limited adverse event table, you can see that there were over 3 times the events in the intervention group. Although the most commonly reported was hyperglycaemia, many potentially serious events were noted only in hydrocortisone patients, including encephalopathy, myopathy and hypernatraemia. Also lots of discussion on the perceived benefit to secondary outcomes – many talking about helping their patients avoid mechanical ventilation and get off the unit quicker. This trial was not really designed to prove these points. Are they extrapolations, or do we think the size of the study and statistical significance of the findings justify incorporation into practice? #adrenal #CCR18 @CritCareReviews does the difference in secondary outcomes just reflect behavioural differences in clinicians when MAP is higher. Will it change my practice? I am not sure it will really. I stopped giving steroids to all patients with septic shock a long time ago. Now I reserve this therapy for those who are terrifically sick, exemplified by resistant shock. Do I think the modest benefit in secondary outcomes shown within this trial warrants extending this practice to less sick individuals? I am not sure I do. Mortality is unchanged as previous, benefits are marginal and the heterogeneity of international practice regarding ICU LOS, transfusion and cessation of mechanical ventilation make me sceptical about whether it is the steroid that achieves these benefits (Ed – plus we should always be especially skeptical about secondary outcomes in any trial). Prescribing any immunosuppressant to a critically ill patient makes me nervous and the secondary endpoint data seen here does not do enough to assuage my nerves. Would I consider it if asked directly? Of course – I think then I would make the point that in this data, maximal benefit appears to be in those less sick, when given at a particular timepoint and that the adverse event rate, whilst low, may treble. Do I think this trial definitely tells me that those on higher doses of vasoactive medications gain nothing from the addition of steroids? No to that also. In fact, I would argue that one of the main signals from this trial is a trend towards mortality benefit in this specific subgroup. But then maybe I am just searching for evidence to support my practice. No-one likes change you know.……. I think that’s enough for now. This is a great piece of work, by a great team, publicised openly and transparently in what I think most would consider to be the future format of medical knowledge dissemination. Everyone involved should be congratulated. I think there will be ongoing debates, but they will be informed, scientific and based on current evidence that is accessible to all. This type of discussion can only ever be good for our patients. And anything that is good for our patients, is to be celebrated. Next: Next post: Belgian EM at BeSEDiM 2018.